Panzanella Salad is a traditional Tuscan salad that uses bread and ripe tomatoes. 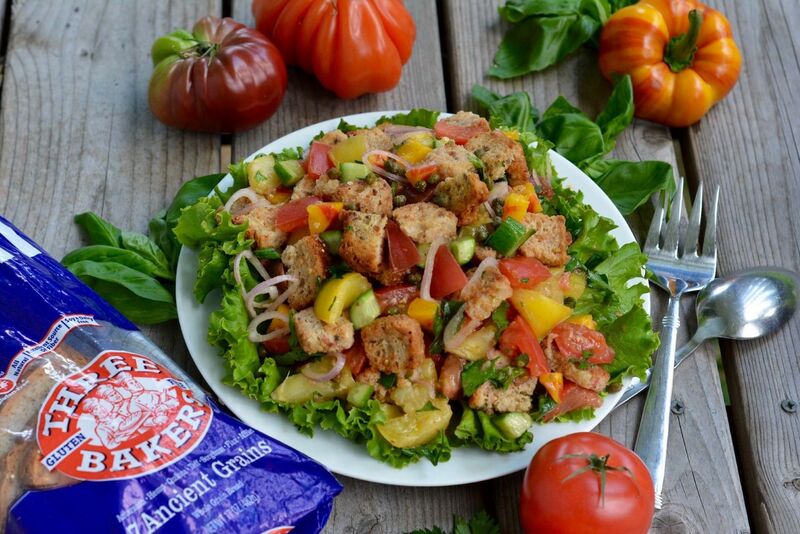 Using Three Bakers Bread you can enjoy this classic summer salad gluten free! Packed with golden toasted squares of 7 Ancient Grains Bread, juicy tomatoes, and fresh basil this salad is the just the thing to nibble on a summer evening. Enjoy! Cut tomatoes into bite-size pieces and transfer to a large bowl. Add shallot, bell pepper, garlic, 1 tablespoon vinegar, oregano, thyme, 1/4 teaspoon salt and the red pepper flakes if using. Toss to coat and set aside. Heat oven to 425 degrees. Toss bread cubes with 2 tablespoons oil and a pinch of salt. Spread on a rimmed baking sheet and bake until they are dried out and pale golden brown at the edges, about 10 minutes, stirring partway through baking. Allow cubes to cool on a wire rack. Putting them on a rack will allow them to dry more than they would on a baking sheet. In a bowl, combine remaining 1 tablespoon vinegar, mustard, 1/4 teaspoon salt and black pepper to taste. While whisking constantly, slowly drizzle in the remaining 4 tablespoons olive oil until the mixture is thickened. Stir in cucumbers, basil and parsley. To the bowl of tomatoes, add bread cubes, cucumber mixture and capers. Toss well being careful to not crush tomatoes. Let sit for at least 30 minutes for bread cubes to absorb dressing. Toss with a little more olive oil, vinegar and salt if needed just before serving.